The terrible murder of 50 innocent people at two mosques in Christchurch New Zealand on Friday and the others injured was an act of terrorism that has been rightly condemned. The Queen’s reaction was impressively quick and her message of sympathy was accompanied by her promise to pray for all the people of New Zealand. Surely all reasonable people abhor such an act and would want to add their thoughts and prayers to hers for the victims and their families. This tragedy raises big issues: the gun culture in many countries; or knives; the rise of extremist ideologies, and the power of the internet to publicize things most people would reject as evil. 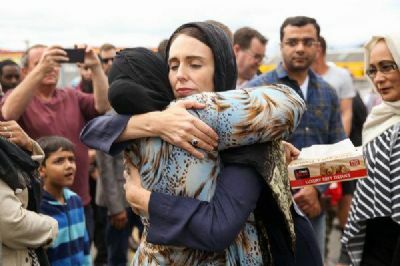 Amidst the horror of that act of hatred in Christchurch were hints of more positive things. An Afghan worshipper aged 48 confronted the attacker and tried to knock him off course. Another man, a 50 year old Pakistani immigrant confronted the gunman but was shot himself. Another worshipper whose wife was killed says he will forgive the gunman and will pray for him. Any of these reactions takes courage. Jesus said, ‘love your enemies, do good to those who hate you; bless them that curse you and pray for them’. It is not easy. If we are met with ill-will or hatred, it is certainly better not to respond with ill-will but with love and peace, care and compassion. What will change things is not legislation but confronting hatred with something better. The Christian faith teaches us to reach across divides. All people are potentially our brothers and sisters if we reach out to them. The creed, and the colour and the name do not matter.